The Arduino is a microcontroller, in the same vein as a Raspberry Pi. The Arduino allows for a variety of peripherals and sensors to be connected. It can then be used to collect information about the world around you and react accordingly. There are plenty of choices out there when it comes to starter kits, so here’s a look at five of the best starter kits for the Arduino. 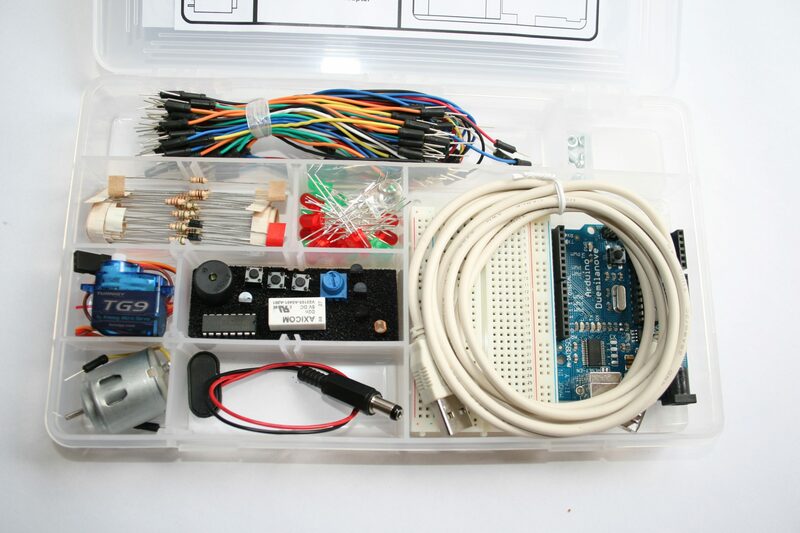 As you would expect from the official starter kit, this package is a fantastic introduction to what the Arduino can do. Included in this kit are a temperature sensor and a DC motor and Servo motor. Using these, you can set your Arduino to make a noise by turning a motor when the temperature exceeds or dips below a particular threshold. Now, this isn’t the most exciting use of the technology at your disposal, but this simple setup demonstrates the fundamental way that most of the microcontroller apps users write will work. The microcontroller takes a measurement for a particular variable (in this case, the temperature of its surroundings), then compares it against something else (in this case, it checks whether the temperature is above or below a certain point), and finally performs an action based on the result (either turning the motor on or doing nothing). This starter kit also comes with a multitude of useful electronic components, resistors, jumper wires, light emitting diodes (LED), a breadboard to build on, and two LCD screens to provide an interface and allow the device to output to something other than your PC monitor. As well as giving you all the tools that you need in order to experiment with your new Arduino, this kit also comes with a 170-page booklet, which contains 15 different projects for newcomers to try out. The booklet is well written and easy to follow. The first chapter has been given over to some of the basic theories of electricity and circuitry. Those who already have experience working with electronics will probably find that they already know most of this, but for beginners, these are very useful lessons. Many of those buying Arduinos are buying them for their children, hoping to stoke an existing enthusiasm for coding or to introduce them to something they might not have considered as a hobby before. If you are looking for a kit that will be suitable for children, then this is one of the best choices, however, most children will require some assistance. Once you have helped them to learn the basics, they will soon be able to fly solo with their own Arduino projects. There is also a deluxe bundle available (price new: $149.95), which also includes a more comprehensive book, ‘Getting Started With Arduino’ produced by Make Magazine. This book includes more project ideas and will allow you to develop your skills and knowledge even further. This kit from Elegoo comes at an absolutely fantastic price. In this kit, you will find a project booklet with a number of relatively simple introductory projects. The booklet contains a CD on which you can find code to copy and paste, as well as pictures of the finished projects so you can see how it should look. This is very useful when you’re just starting out. It takes time to become adept at visualizing circuit boards. Between the ability to copy code directly from the CD, and the pictures of the completed project circuit boards, identifying bugs and other technical issues becomes much easier. The bundled booklets will give you plenty to work with, but it is the tools for experimentation that this kit contains that makes it really exciting. Over 200 components are included (63 different types of component). Among these are the usual basics that you would expect, i.e. buttons, resistors, LEDs, etc. But it also comes with a few less common components, which open up a myriad of new possibilities. The RFID reader is a welcome addition. This relatively simple and cheap piece of tech is still rarely included in such kits. Water/moisture sensors, as well as the accelerometer and gyroscope module and motion sensors, allow you to use the Arduino as a security device. Not only can you program the Arduino to respond to any motion in its vicinity, but if placed in the same room as (or even in the case of) the Arduino can be used to ensure that ambient conditions remain suitable for instruments and other sensitive objects. One final thing to say about this kit is that it is very nicely presented. Everything comes in a clear plastic case, which both keeps all the components organized, and provides space to store smaller parts safely while they are not in use. The microcontroller itself inside this kit is a clone from Elegoo which, while different to the official Arduino, functions in the exact same way. This is a great kit for both newcomers and those who are returning to microcontroller programming after a hiatus. While this is not an official Arduino microcontroller, Elegoo is known for being one of the better quality third-party manufacturers and the kit demonstrates this well. Some users have reported issues with the example projects when they try and replicate them, but these reports are sporadic and do not represent the experience of every customer. Alongside the lessons, the CD contains some very useful references for coding. These will be particularly helpful when you start to explore your own projects that go beyond the scope of the examples. This Arduino kit from Elegoo comes in at a slightly lower price point than the one above; it also contains fewer components. However, while you won’t be able to do quite as much with this kit, it still contains plenty to get you started. One of the main selling points of the Arduino is the easy availability of components and peripherals, which simply plug into the board and are instantly ready to go. For some people, having fewer components will actually be better, as the more fully featured bundle could be overwhelming in the number of components to choose from. This is also an excellent starter kit for those who are working on a budget. For the $35 or so that the kit costs, you will get everything that you need to experiment with the most popular beginner projects. Among the components that this kit includes is an LCD screen, something which adds considerable scope to your projects on its own, and basic electronics, such as resistors and pushbuttons. The kit also comes with humidity and temperature sensors, as well as motors. In lieu of the booklet, which the more expensive Elegoo kit offers, this starter jut comes with a PDF document, essentially a digital booklet which contains a more focused selection of instructions for more than 20 lessons and instructions. The whole kit is, like its bigger sibling, presented in a handy plastic case, which can be used to keep small components safe. The build quality of this kit is exceptional for the price point. In fact, considering the price alone, you could be forgiven for thinking that this kit represented the lower end of the quality spectrum, but this is not the case. Not only will this starter kit introduce you to the world of Arduino in an accessible and enjoyable way, it will also serve you well when you begin to expand your repertoire and start looking at additional components and peripherals. There are many Arduino starter kits out there, and all too often they do little to differentiate themselves from one another. This creates an issue for both buyers and sellers. From the perspective of a customer, the dizzying array of similar kits makes choosing between them difficult. For the sellers, they need to try and find a way of setting themselves apart that doesn’t dramatically hike up the price. In the case of this starter kit from 16Hertz, it is the inclusion of a multimeter, also known as a volt-ohm meter, that makes it unique. This component, not bundled in with many starter kits, can be used to measure voltage, current, and resistance. It is, therefore, an excellent tool for those who want to learn more about how circuits, and electricity more generally, works. The multimeter included in this kit is of relatively low quality (although by no means unreasonable given the price point) but still works perfectly as a learning tool. If you are buying the Arduino for a child who is eager to learn more about coding and circuitry, then this will add another dimension to the experience. Aside from the inclusion of the multimeter, this is a pretty standard, but still fully featured, starter kit. As with many of the other kits on this list, the microcontroller itself is third-party rather than an official Arduino, but it is fully compatible and of excellent quality. The starter kit comes in a clear plastic case, which makes keeping the components contained within organized. Among the other components in the kit are the usual electronics such as resistors and LEDs, alongside an impressive selection of modules, which includes an ultrasonic sensor, a remote control, and accompanying infrared receiver. Featuring a genuine first-party Arduino board, this starter kit contains everything you could want or need to get your first Arduino projects off the ground. The booklet included is 72-pages and in full color, making it easy to follow and very helpful for beginners who are still just getting to grips with the world of Arduino. As well as providing instruction on the coding, which includes the basics of C/C++, the language that Arduino uses, this booklet contains detailed information about each component. The approach that the booklet in this starter kit takes is much better suited to those who want to learn by their own experimentation. The booklet is designed to equip the user with all the knowledge they need to work out their own project routes. Learning how to apply the theory that you learn to devise your own project ideas is an incredibly valuable skill. It takes time to develop but is well worth the investment. Alongside the component overviews and programming lessons, the booklet also contains 12 example projects. For each of these, a complete circuit diagram is provided, as is a list of the components that are used and pictures of the finished project to help you with troubleshooting. This booklet also contains examples of potential real-world applications for each of the projects, something which many other kits overlook and which, again, encourage the user to think about the projects that they work on in a new way. This starter kit comes with example code on a CD. This example coding not only demonstrates correct formatting, it also contains comments which highlight certain key features of the code. Overall, this starter kit is one of the strongest in terms of the quality of the teaching that it provides. It encourages users to look beyond the example projects and to consider what the Arduino, and the underlying programming language, is capable of, and how it can be applied to the real world. Arduino starter kits are an excellent way of introducing the world of microcontrollers, coding, and electronics to children and adults alike. There are a plethora of different Arduino starter kits out there. Choosing between them can seem like a difficult and murky business at first, but the good news is that there are many excellent options out there. If you are buying the kit for a child, then be prepared to sit and work with them in the beginning. Once they have got the hang of the basics and have a few example projects under their belts, they should find it easy to develop their skills further.